From the architect. Ananta Legian is situated behind Legian Beach, and due to the lack of sufficient area, it was built on a long, narrow site surrounded with local settlements and hostelry buildings. This situation makes the hotel virtually hidden by the other buildings, making it invisible from the beach. Consequently, the seascape is difficult to be enjoyed from the hotel area and, although the hotel is located within walking distance from the beach, access is not easy. But the difficulty in accessing the hotel area is offset with an opulent lobby building that welcomes visitors in the drop-off area before their vehicles head to the basement parking area. The lobby is a pyramid-like building with blunt top inspired by the form and characteristic of Balinese glass handicraft, and the floral Balinese traditional ornament. In order to create a sense of sacredness and a philosophical meaning, the ornament was transformed into its traditional element accentuated by Patra Sari—a painting made by I Wayan Lungguh, a local artist—and other local paintings on the lobby building. These paintings, far from being merely accents in an interior, have powerful meanings on divinity, life, and eternity. These paintings were converted into a handmade carving with Glass Fiber Reinforced Concrete (GRC) material and were applied throughout the lobby as secondary skin which help to reduce the heat from the sun. The lobby building was constructed with steel frame structure to pin two layers, the glass inside and the carving outside. These layers are separated by a 50-centimeter wide space between the glass and the carving for maintenance needs. This layering system creates an aesthetic three-dimensional effect to the GRC carving, and a shady and mild ambience to inside of the building. To prevent overheating on the inside of the building, it was designed with an open gate and the glass layer served as natural ventilation. At night the lobby is flooded with light, transforming it into a beautiful carved lantern. The attractive lobby is also intended to complement the simple form of hotel building behind it. As a focal point and façade of the building façade, the lobby is not only beautiful, but also poignant. The hotel building was arranged in a simple U-shaped building with a nook on the left side in order to create a more dynamic sense of space. The lack of view was resolved by creating a view for guest coming and for guest who already in the hotel. 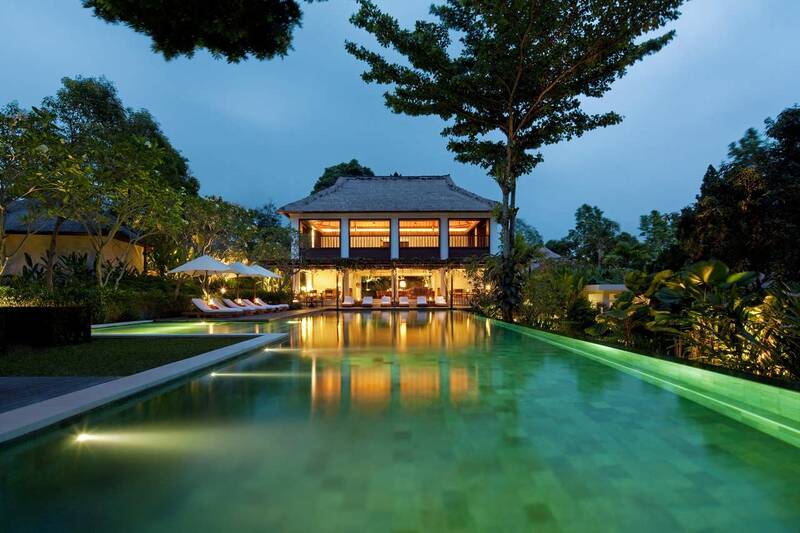 An open space located in the middle of the hotel area acts as a latar –the open space in Balinese traditional house. In this area, the open space functions as public facilities equipped with a swimming pool, a restaurant, a coffee shop, and a meeting room. 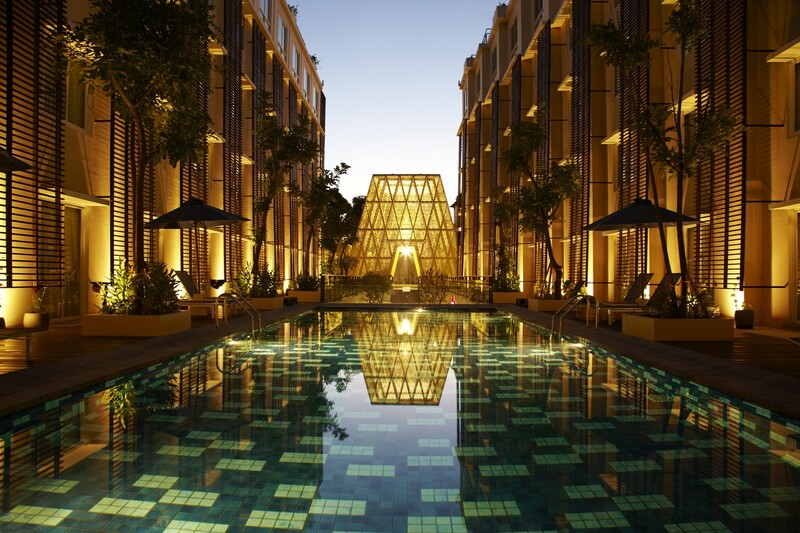 The swimming pool is located precisely in the axis of the lobby, making visitors feel welcomed with the water that reflects the ambience of its surrounding. The swimming pool and the lobby pavilion was designed in such a way that create impressive view. A grand stairs is also located in the same axis to connect the lobby and the public facilities on the semi-basement floor. This stairs is designed to bring visitors to experience a ‘ceremonial’ atmosphere that usually reserved for pedanda—the high priest in Bali. Water element, such as a pond with four frangipani trees and artificial waterfall, is also prominent in the entire open space. These elements create a stronger experience of continuous space in this narrow site. In order to soften the massive wall that surrounds the open space, metal frameworks covered with vines are applied to create green walls. As a result, this open space creates a relieving and warm ambience for guests, become a view for the guest to enjoy.